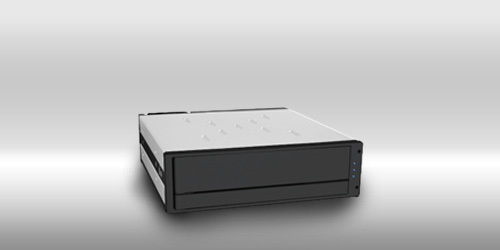 HyBrid RunneR iH1010, an internal hybrid removable storage solution of 2.5" SSD and 3.5" HDD equipped with SATA II host interface. HyBrid iH1010 fully takes the advantages from the performance of SSD and utilizes from the beginning sectors of HDD to backup the identical data from SSD regularly, or simultaneously for the prevention of possible data loss caused by SSD failure. 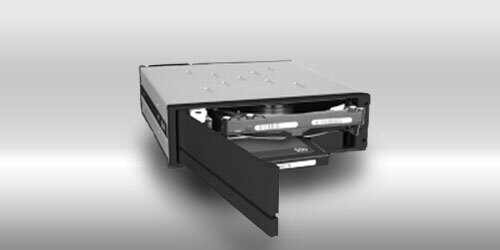 In addition, HyBrid iH1010 further grants the usage of remained capacity from HDD to provide sufficient extended and cost-effective storage capacity to users without any wastes. Fully benefits from the read/write performance of SSD which is twice faster than HDD, meanwhile obtains the advantages of large storage capacity from HDD. HDD reserves an equivalent data space from its beginning sectors for SSD data real-time backup or backup scheduling to prevent data lost from unexpected SSD failure. You are able to take SSD with RAIDON J1 (USB 3.0 enclosure) with you while working on field as a portable storage to enhance performance and data mobility. Backup function will resume when the original SSD is inserted back into the iH1010 and overwrites HDD saved data from SSD to HDD. When SSD failed unpredictably, iH1010 can easily recovers the data to the new SSD as when it is inserted and provides user a reliable and consistent operation. None of the screws or tray modules required for SSD / HDD installations. Mounting screw layouts and dimensions are identically matches a 5.25" CD-ROM Drive.